Bus from Kota Bharu to Johor Bahru remains as the most popular choice for locals to travel from Kota Bharu to Johor Bahru. 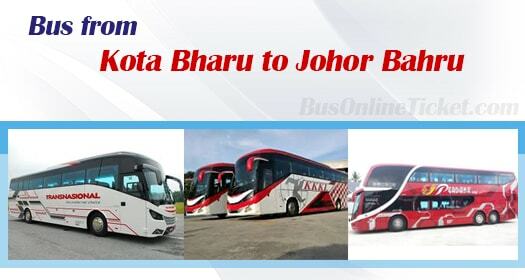 Even though bus service now is facing strong and rapidly growing competition from budget airline, bus remains as the most preferred transportation option to travel from Kota Bharu to Johor Bahru due to its lower cost and greater convenience. Transnasional, KKKL Express, and Perdana Express are the three bus operators operating bus from Kota Bharu to Johor Bahru. Transnasional is providing 2 daily departures while KKKL Express and Perdana Express provide one daily departure. Perdana Express is the only players providing double deck VIP coach for the passengers' comfort. Other two operators Transnasional and KKKL Express are operating with single deck VIP coach. Both types of VIP coaches are installed with spacious seats so that passengers feel comfortable during the long hour journeys. Duration required for bus from Kota Bharu to Johor Bahru is about 12 hours, depending on the traffic and weather conditions. Please note that holiday season may increase the volume of traffic and extend the travel time from Kota Bharu to Johor Bahru. The bus ticket price from Kota Bharu to Johor Bahru is charged in the range of RM 64.10 to RM 70.00, depending on your choice of bus operator. Transnasional does offer child fare at RM 48.10 for those who travel with young children. All the buses from Kota Bharu will pick up passengers at Kota Bharu Bus Terminal and drop off passengers at Larkin Bus Terminal. From Larkin Bus Terminal, passengers can take public bus, Johor Bahru cross border bus and taxi to visit their next destination. With limited bus schedule from Kota Bharu to Johor Bahru, passengers are advised to book their bus tickets online in advance at BusOnlineTicket.com. Instant confirmation of booking will be sent to your email upon payment is done.